These exceptional antique George V sterling silver sauceboats have a plain oval rounded form, in the classic English, George III style. The body of each piece is plain and unembellished with a plain incurved shaped border to the rim. The sauceboats are fitted with opposing scroll handles featuring a plain scrolling thumbpiece. Each example of antique silverware is supported by three impressive applied hoof feet with stylised shell decorated sockets in junction with the body. 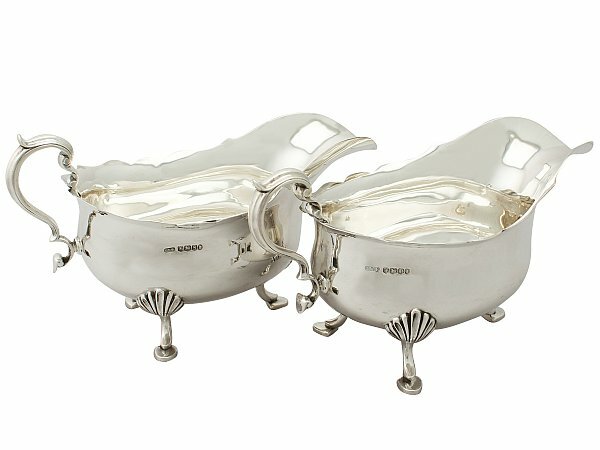 These exceptional and large silver sauceboats were crafted by the Sheffield silversmith Charles William Fletcher of C W Fletcher & Son Ltd. These antique sauceboats are an exceptional gauge of silver, exceptional quality and in exceptional condition. There are some natural fire marks to the body of each sauce boat, in keeping with age. Full hallmarks struck to the surface of each sauceboat are all very clear. Length from back of handle to tip of lip 21.9cm/8.6"
Height to top of handle 11.4cm/4.5"